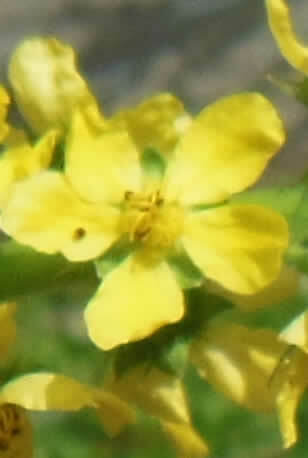 Agrimony, from the Greek Argemone meaning healing to the eyes; the herb was well known to the Greeks as a wound herb. Find it a sunny spot along the garden fence watch for the small, 5 petaled, yellow flowers to rise up in bright terminal spikes in the summer, signaling it is ready for harvest. Agrimony is the wallflower of the rose family and does not garner as much attention as its showy rose sisters, yet has much practical value for the herbalist. It acts as a mild astringent gentle enough for everyday use for the whole family, including children. Agrimony has a pleasantly mild lemon flavor that works well as a single tea and blends smoothly with raspberry, lemon balm, and rose hips. Cautions: Safe and non-toxic in moderate amounts. Excessive use could aggravate constipation.